From all these discoveries of extra-solar planets over the years, even in places where planet's shouldn't have formed, one would come to the conclusion that planets are relatively easy in the cosmic scheme of things to create. And this is just planets that are massive enough to be detected by current means, technology, and techniques, let alone worlds equal or smaller to that of Earth. Though it does raise the question as to what the ratio of planetary star systems are in comparison to stars that lack any planets, let alone those whose chemistry allows for habitability for life as we currently know it. Then we come to the problem of how the *bleep* do we as a species can make the one way trip to those planets within the human life span, let alone a round trip. I saw a figure a couple of years ago that about 7 percent of candidate stars have a planet detectable by (then) current means. The proportion must be creeping up as our instruments get more sensitive. What we have not found many of - yet - are 'normal' planetary systems, or what we thought would be normal, i.e. more or less like the Solar System. But this may be selection bias. The radial velocity method that found these planets needs a full orbit, more or less, to confirm a discovery, which means a decade or more for a Jupiter analog. As for getting to them, very difficult! Barring magic AKA FTL, it is unlikely we'll be going there in the midfuture, and perhaps not for a very long time. I seem to recall some sort of analogy to a biologist casting a net into the surf in order to find out what kind of life is in the sea. He then concludes that there are no life forms smaller than 2" in the sea and all sea life has gills. That is of course preposterous, but it is the false impression based on the testing method (using a net from the shore). The same can be said for our methods of detecting planets. We can only detect those planets that have an ecliptic in line with Earth (thus we can see them pass in front of their star) or they are so large and close to their star that we can see the star wobble. Whether a star has planets may depend heavily on the neighorhood environment when the star was formed. If it forms in a very rich cluster the protoplanetary disk may be disrupted before planets form; if it doesn't, it seems more likely to have planets of some sort. In 30 years, yes, we will know a lot more! Pause to note that while human exploration has been slower than we expected in the late 1960s, our overall progress in exploration has been astonishing. In the old stories, no one knew whether another star had planets till they sent a survey ship. If you count Hubble's Ultra Deep Field, we've explored out to 13 BILLION light years. Erk... I just watched an episode of Cosmic Journeys that asks how large the Universe is... It seems my 13 billion is the supposed AGE of the Universe while we've scanned out to about 40 billion light years north and south of Earth. Which puts the observable universe at over 8 billion light years. What's more, theory dictates that the universe cannot be smaller than about 150 billion light years across. There is also evidence that the universe is not only growing, but it is accelerating outwards. In order to get to its current size, the universe would have to have averaged 5 times the speed of light in the time that it has had to expand. To me, this says that accelerating through space is not the way to go fast. We will need some sort of ability to squish space and travel across vast distances at much lower speeds. 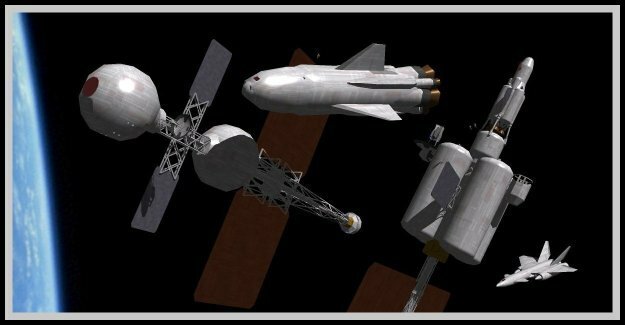 Of course, there is no indication of space getting smaller, only larger, so this could be a case of trying to put the genie back in the bottle. By the way, there is an update on the findings at Sky & Telescope. 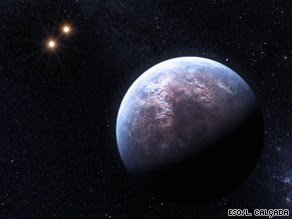 Apparently the planet in the artist's conception is in a triple system, and the bright stars in the background are the two more distant components.